GOTCHA: Ryan Sidebottom celebrates after Tim Bresnan, second left, takes the catch to dismiss Durham's Michael Richardson. Picture: Steve Riding. THERE were one or two blemishes – there always are – but, pound for pound, this was as good a performance as Yorkshire have produced all summer. Considering the strength of the opposition (and Durham are no mugs, despite their lowly league position), the nip-and-tuck nature of the title race, and the fact that this is the business end of the season, Yorkshire’s 228-run victory was hugely impressive. Tim Bresnan and Andrew Hogg celebrate Yorkshire's win against Durham. Picture: Steve Riding. It was the triumph of a team that looks to have run into form at just the right time, a team that knows how to win County Championships. Yorkshire head into their penultimate game against Somerset at Headingley, starting on Monday, one point behind leaders Middlesex, their opponents in the final round, and looking well-placed to win their third successive title. There certainly seemed little doubt that Yorkshire would wrap up their fifth victory of the season going into the final day at Headingley. Durham were 39-3, needing 421, and one doubts that even they believed that they could hold out for the draw – never mind chase a fanciful target, the highest that any side would have made at this ground. An already hopeless cause became utterly so once Ryan Sidebottom had reduced them to 63-6 inside the first nine overs. Bowling from the Rugby Stand End, where spectators sheltered from a howling wind on a mostly cloudy day, the veteran campaigner delivered the umpteenth masterclass of a career that will next year celebrate its 20th anniversary. With the 16th ball of the morning, Sidebottom had nightwatchman Graham Onions caught in the covers by Gary Ballance off a looping drive. In his next over, Sidebottom trapped Scott Borthwick lbw before making it three wickets in 18 deliveries when he pinned Paul Collingwood, offering no shot. Later, the 38-year-old returned to have Michael Richardson caught at first slip by Tim Bresnan on his way to a season’s-best 4-34. Considering that he missed three months of the season through injury, Sidebottom has still managed 25 wickets at 21.24 to sit top of the Yorkshire averages. After Sidebottom’s triple salvo, the only question to be answered was whether Yorkshire would win before lunch. But the seventh-wicket pair of Graham Clark and Michael Richardson rallied to add 49 inside 19 overs, defending solidly and attacking selectively. Clark played some pleasant strokes, including a pulled four off Jack Brooks, while Richardson drove Yorkshire’s leading wicket-taker to the extra-cover boundary. However, the tireless Bresnan broke the stand 20 minutes before the interval, having Clark caught behind, and Richardson had moved on to 30 by the time Durham took lunch at 129-7. Yorkshire were not unduly delayed in the afternoon session. Sidebottom got rid of Richardson eight overs into it, and Durham fell to 171-9 six overs later when Bresnan had Barry McCarthy caught at second slip by Adam Lyth. Fittingly, it was Brooks who finished the job, knocking out two of Chris Rushworth’s stumps in spectacular style. Brooks ended with 3-55 to go with first innings figures of 4-76, the pace bowler having played another key role. “Brooksy has been exceptional for the last four or five weeks,” said captain Andrew Gale. Gale was pleased with a victory that ticked most boxes. 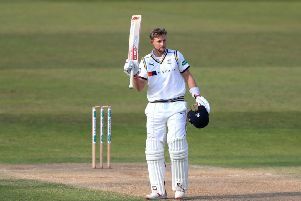 After being asked to bat, Yorkshire scored 460 on the back of a fine century by Alex Lees. The champions dismissed Durham for 265 and then declared on 225-2 in their second innings, Adam Lyth making a hundred and Lees falling just short of another three-figure score. Durham were bowled out for 192 yesterday and now sit sixth in Division One, six points above the relegation zone. “I said to the lads afterwards that it was the best all-round performance we’ve had all year,” said Gale. “To get 460 first dig on a pretty tough pitch really, with plenty of moisture in it, was a great effort, and then we were outstanding with the ball. “Now we’ve got Somerset, who are playing some good cricket and who will be coming here full of confidence. While Yorkshire take on third-placed Somerset, who are 21 points adrift of the champions, Middlesex face Lancashire at Old Trafford. Yorkshire then play their final game against Middlesex at Lord’s. “Everything’s pointing to Lord’s,” said Gale. “It would have been nice if Middlesex had slipped up against Notts this week, but they’re playing some really good cricket and they’ll be desperate to win the Championship too. “We’re desperate to make it three-in-a-row, and we’re just enjoying the challenge, to be honest.